When the name Sicily pops up, we don’t make the immediate association with snow. Same goes for volcanoes. Rather, the mind delivers thoughts of a hot and arid environment. With Etna however, these thoughts are won over by the reality that in the winter, the Volcano is covered with snow and ice. Well aware of this natural paradoxical wonder was Beni Böhm, Schorsch Nickaes and Patrick Jost, which lead to the spectacular sea to peak climb that stamped an ascent time record for the mountain. You can never train too much, only too fast. Training is a natural component in the lives of Schorsch, Beni and Patrick. So when it came to this event, they put in the sweat. 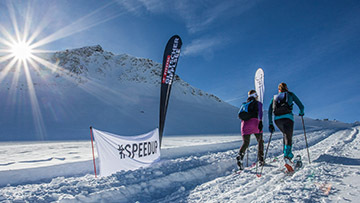 Many training sessions, accumulating many hours, and atleast 2.500 vertical meters each session provided them with the necessary foundations to tackle this mission. 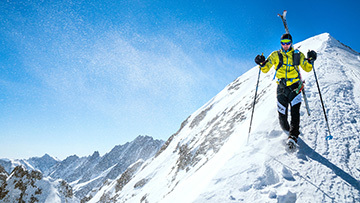 “You can never train too much, only too fast”, reveals Patrick, the mountain guide. Even the equipment in this kind of scenario, plays an imperative role. 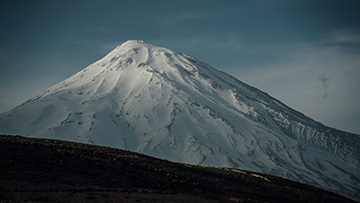 Lightweight is a clear must, but also robust equipment is needed to be able endure the demanding conditions of the Volcano. Clothing too, is highly important. Their confidence was settled in the Mezzalama product collection, which provided them with material that holds necessary warmth, and the ability to release any transpiration of the body. This line proved to be ideal for a climb that goes from sea to peak. All three of them have quite the experienced track record in the realm of skiing. 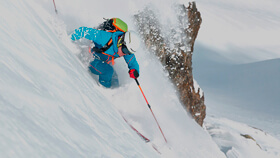 Countless peaks around the world have been tainted with the tracks of their skis, multiple 8 thousander’s have experienced their speed climbing prowess, and many classic ski-touring races have witnessed their determination. Although they’ve explored almost every mountainous corner the globe has on offer, they have never set foot on an active volcano nor have they ever climbed from sea to peak.